Attractive and twenty-eight, Kate Wilson is trying to rebuild her life after a broken relationship when she attends an animal rights meeting one evening, encouraged by her friend, Steve. 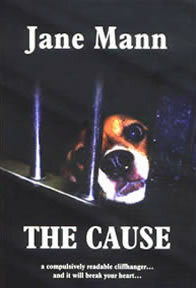 Here for the first time she meets and hears the dynamic activist, Mark Stanton, whose aim is to bring to an end all animal experimentation and suffering in the notorious company, Draco Life Sciences. Reluctant at first, Kate, impressed by Mark, is gradually drawn in and then ersuaded to go undercover to get vital information. Soon she realises that Mark has enemies both inside and outside the movement, as well as the authorities on his trail, causing tension and constant danger. Gradually as she becomes more involved, Kate falls in love with Mark. But can her love break throught his dedication to the cause and can Mark succeed with the forces closing in against him? The Cause will make you question, make you angry, make you weep. It helps us to understand the motivation and determination of those who want to bring the practice of vivisection to an end and value animals for what they are - as sentient beings.